(VEN) - The agricultural sector is missing linkages between production and consumption, making them an urgent priority. Ma Quang Trung, director of the Department of Cooperatives and Rural Development under the Ministry of Agriculture and Rural Development, said the development of linkages between businesses and farming households through the agricultural cooperative model in order to organize production and promote consumption is an urgent requirement. Agricultural production remains small, while product quality has not yet met all the requirements. Farming households have not paid much attention to linkages to create concentrated production areas, whereas businesses often prefer to sign contracts with large farms. Missing linkages between businesses and farming households results in the loss of price and unsustainable development of agricultural production. According to Ma Quang Trung, product consumption still depends on intermediaries, so the actual selling price is much higher than that of the production base. He added that there are around 400 value chains nationwide but the demand for cooperating between businesses and farming households remains huge. Deputy Minister of Agriculture and Rural Development Tran Thanh Nam said that increasing added values of farming products and reducing production costs are major challenges for agricultural production, which require the development of a value chain. In addition, it is also important to develop large-scale and stable raw material areas. The Department of Cooperatives and Rural Development signed an agreement with the Cooperative Union of Agriculture Consumption on November 13 to develop production and distribution linkages for agricultural products. The two sides also completed a project on building and developing a value chain of Vietnamese safe agricultural products, which has been submitted to the government for approval. 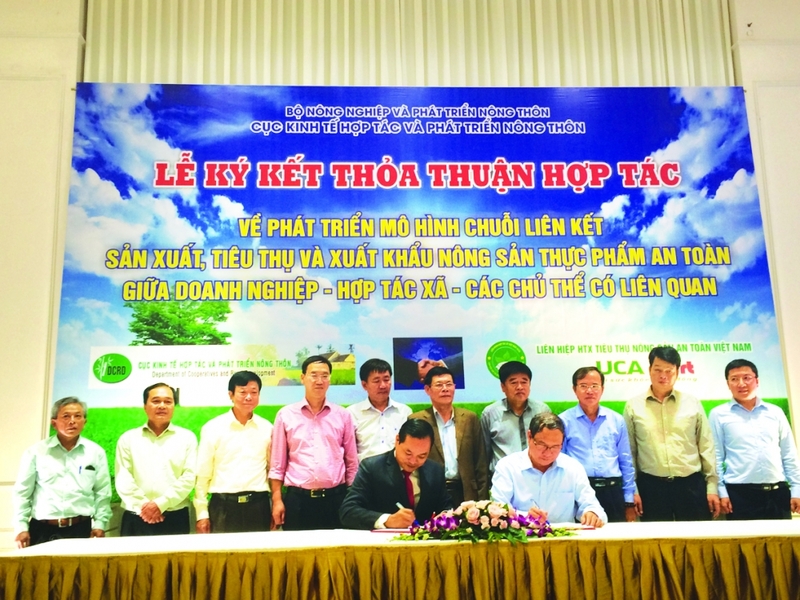 The Department of Cooperatives and Rural Development signed rice production and consumption agreements with the Vietnam National Seed Joint Stock Company and the Toan Xuan Co., Ltd. Accordingly, they will build and develop production and distribution linkages in four provinces - Thanh Hoa, Dak Lak, Lao Cai and Nam Dinh. Their main products are Japonica, Thuan, Lai and Bac Thom 7 rice varieties. The Department of Cooperatives and Rural Development also signed contracts with the Lam Son Joint Stock Corporation and the Thanh Thanh Cong Gia Lai Co., Ltd. to promote sugarcane production and consumption. Major pilot contents consist of building and developing the agricultural cooperative model, forming linkages between businesses and farming households in five provinces - Thanh Hoa, Gia Lai, Son La, Khanh Hoa and Hau Giang. Le Van Tam, chairman of the Lam Son Joint Stock Corporation, which had maintained a sugar production linkage with cooperatives and farmers since the 1990s, said that 80 percent of the corporation’s raw materials were provided by farmers. The corporation aims to build 40 new-style cooperatives in 40 communes in Thanh Hoa Province to develop linkages in production and distribution of sugarcane, safe fruit and vegetables. Le Van Tam also said that businesses should have stakes in cooperatives to enhance accountability. Farmers should also be given preferential interest rates on loans. According to experts, the development of linkages between businesses and farming households to organize production and promote consumption is an urgent requirement. It will help increase added values of farming products and reduce production costs. Ma Quang Trung, director of the Department of Cooperatives and Rural Development under the Ministry of Agriculture and Rural Development, said the pilot model on linkages between businesses and farming households will be implemented until 2018, then will be reviewed and documented to introduce to localities in 2019.